Recently the San Francisco Estuary & Watershed Science journal published a special issue that included a paper on Delta Smelt. The paper is an excellent summary of the present state of Delta smelt. The discussion section on p. 18 of the paper provides an excellent description of the whole of Delta Smelt science. The paper is comprehensive with a litany of scientific references on Delta science and the decline of the Bay-Delta estuary and the Delta Smelt. It also provides an outlook and prescription for the future, though bleak. In this post I offer slightly more optimism with focused solutions, based on a somewhat different take on several key issues. Bear with me as I go through each issue and my usual array of diagnoses and recommended treatments that could bring smelt back from the brink. “The role of density dependence has been an area of emphasis for these population dynamic studies. An apparent decrease in the carrying capacity of the estuary in the 1980s resulted in an increase in density-dependent mortality from the juvenile stage in late summer through the adult stage in fall (i.e., between the TNS and FMWT indices) (Sweetnam and Stevens 1993; Bennett 2005; Maunder and Deriso 2011).” p. 9. Density-dependent mortality means that fish get so abundant that it reduces their growth and survival through competition. There is no evidence of this dynamic in the Delta smelt population indices (Figure 1). The number of smelt in fall is simply related to summer flow and exports, and most importantly to the starting number of summer juveniles, which is most certainly related to flow and exports (Figure 2). The latter is density independent – survival was not lower at higher initial numbers or vice versa. Density dependence might be expected in conditions of very, very high abundance of juveniles that competed amongst each other for food, possibly even driving down their food supply. That is simply not possible at the extremely low population levels that exist at present and that have existed in the recent past. “In general, the relationship between sub-adult (spawner) abundance indices and juvenile abundance in the following year is poor (i.e., between the FMWT and TNS indices).” p. 9. No, the relationship between spawner abundance and juvenile abundance is strong (Figure 2). The number of young smelt produced is much reduced in most dry years because of their lower flows and higher exports. Low exports in the wetter years 2010 and 2011 from restrictions in the 2008 Smelt Biological Opinion really helped. Those restrictions were not in place in red-circled 2005. “Given the annual life cycle, any episodic salvage event may undermine population resilience by keeping numbers low, even when environmental conditions are good.” (p. 14). “Presently, Mississippi silverside is probably the most important predator of Delta Smelt larvae because of their ability to prey on eggs and larvae and their high abundance in shallow areas where Delta Smelt spawn (Bennett and Moyle 1996; Bennett 2005; Baerwald et al. 2012).” p. 14. “Although Delta Smelt remained abundant in the Delta and Suisun Bay through the 1970s, long after most introduced fish predators and competitors had established populations (Grossman, this volume), smelt began rapidly declining after the invasions of overbite clam and Mississippi Silverside in the 1980s.” p.7. Silversides were also abundant in the late 70’s (no 80’s invasion), but were in my opinion suppressed by very abundant juvenile striped bass. This effect persisted until the striped bass population crashed at the beginning of the new century. Note the relative abundance of silversides (smelt predator and competitor), threadfin shad (competitor), and yellowfin goby (predator and competitor) in the western Delta in 2006 (Figure 3), and the low density of striped bass. Next, note the depressed relative abundance of these same species in the western Delta in late summer and fall of 1978 (Figures 4-7). Note also the much greater abundance of juvenile striped bass and even some Delta smelt in 1978. While such evidence may be circumstantial, it clearly shows the role that striped bass once played as the dominant predator in the Delta. Now I have to ask the questions: (1) what caused the “invasion” of silversides in the 80s; and, (2) what was the role of striped bass? “Largemouth Bass will consume Delta Smelt in mesocosms (Ferrari et al. 2014), but are unlikely to be a major predator in the wild because of limited habitat overlap between the two species.” p. 15. There really is no proof of this. Largemouth are found pretty much throughout the Delta, including areas where juvenile smelt are found in summer and fall. With largemouth far more abundant than smelt, it is likely that smelt come across largemouth frequently. I have caught both species in the same seine in the fall, on several occasions. “While Delta Smelt have a fairly broad salinity tolerance; they were historically most abundant in the low salinity zone (LSZ) of the estuary, the position of which is determined by outflow (Moyle et al. 1992; Kimmerer et al. 2013; Sommer and Mejia 2013). 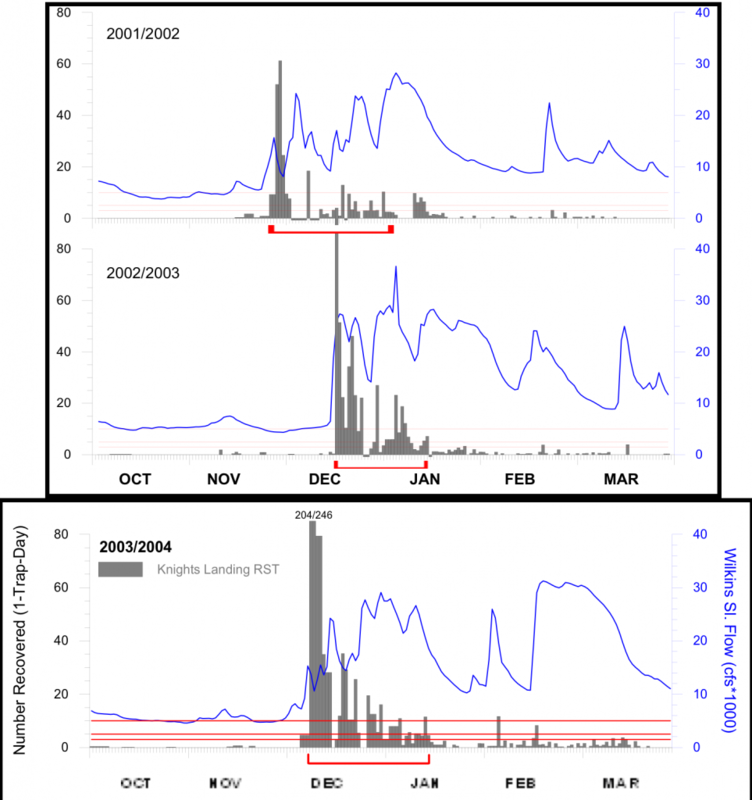 Moderate hydrological conditions in late winter and spring place the LSZ in the Grizzly Bay region of Suisun Bay (Jassby et al. 1995). These conditions were beneficial to the Delta Smelt population at least partly because of high food abundance. At present, there is little evidence of the benefit of summer and fall occupancy in the LSZ (IEP MAST 2015).” p. 16. “Warm water temperatures during summer exacerbate stress from low food availability and may explain reduced survival from summer to fall in some years (Bennett 2005; Bennett et al. 2008).” p. 14. “In addition to moving the LSZ to a favorable location for smelt, increased outflow influences habitat quality through its effect on food supply, dilution of contaminants, and turbidity.” p. 16. Water temperatures are a problem in most summers, especially when the LSZ is located in the Delta. “Reintroductions will have to be done within a few years of loss of wild fish, into an environment with better capacity to sustain them.” p. 19. The X2 location in fall offers good habitat in most years. The problem is that juveniles are unable to survive to get to LSZ. The carrying capacity of the LSZ in the fall is likely underutilized in most years. Adding hatchery fish now to surviving wild fish will be better than waiting for wild fish to be gone. It might be essential at this point. “If increasingly unfavorable temperatures for smelt occur, predicted as a result of climate change, then special refuges may have to be created that can take advantage of cooler water in the Sacramento River or from water that is piped in from some other source.” p. 20. Existing refuges already need protection. The Ship Channel and lower Cache Slough refuges can take advantage of the cooler water exiting the American River near the Port of Sacramento River. Flow from the Fremont or Sacramento weirs could enhance Yolo Bypass flows and water temperatures. The LSZ-X2 refuge can be cooler if located west of the Delta and subject to the Bay breeze; maintaining x2 west of the Delta would require higher spring, summer and fall Delta outflow. Protection and enhancement of the Montezuma Slough refuge portion of the LSZ is possible through better Delta outflows and controls offered by the Montezuma Slough Weir. The following actions, if implemented soon, could lead to marked improvement in the population of Delta smelt. Limit entrainment. Minimize exports in spring, especially when pelagic larvae are found in the central Delta. Keep the LSZ out of the Delta, especially in warm, dry years. Use the Montezuma Salinity Control Weir to maintain Montezuma Slough in Suisun Marsh as part of the LSZ. Enhance the spring Delta inflows from the Yolo Bypass and San Joaquin River. Opening the Delta Cross Channel and installing the Head-of-Old-River and False River barriers will help. Closing the Knights Landing Outfall Gates in dry years will force more flow down the Yolo Bypass. Constructing the “Notch” in the Fremont Weir will increase flow through the Yolo Bypass. “Fixing” the entrance gate at the Port of Sacramento to the Ship Channel would allow additional Sacramento River flow input to the Ship Channel and lower Bypass. Stock hatchery-reared Delta smelt adults in the fall at X2 location, conditions permitting. Figure 3. Numbers of fish collected in the fall of 2006 along San Joaquin River shoreline near Antioch by species and size. Note the extreme abundance of silversides, followed by threadfin shad and yellowfin goby. Note the very low numbers of striped bass. Figure 4. Numbers of fish collected in late summer 1978 along San Joaquin River shoreline near Antioch by species and size. Note the relatively high numbers of striped bass relative to silversides and threadfin shad. Figure 5. Numbers of fish collected in late summer 1978 in Sacramento River shoreline near Montezuma Island (adjacent to Collinsville) by species and size. Note the high relative abundance of striped bass young. Delta smelt were actually more abundant than silversides, yellowfin goby, or threadfin shad. Figure 6. Numbers of fish collected in fall 1978 in San Joaquin River shoreline near Antioch by species and size. Note silversides were relatively abundant along with striped bass and threadfin shad. Figure 7. Numbers of fish collected in fall 1978 in Sacramento River shoreline near Montezuma by species and size. A recent paper in the North American Journal of Fisheries Management1 describes a nationwide 20% decline over the past two decades in sport fishing for trout. The trout angling population is getting older, while the number of young recruits is declining. With shrinking revenues from license sales, trout anglers and agencies are concerned about potential reductions in the numbers of trout stocked and the quality of popular trout fisheries supported by stocking. Though the researchers found little relationship between the numbers of trout stocked and catch rate (within normal levels of stocking and catch rates), they did find a positive relationship between angler satisfaction and catch rate in the Virginia lakes and rivers they studied. They also found greater satisfaction with greater size of trout caught. Average catch rates of stocked trout were approximately one per hour. Total angling hours were much higher for lakes than streams primarily because of ease of access and less need for equipment. This past June, I wrote a post on Lake Davis, a popular Sierra trout fishery. In that post, I spoke of perceived angler dissatisfaction with low catch rates. Rates had fallen well below one-per-hour in recent years, into the range where angler satisfaction was very low in the above-described research paper. I suggested that the poor catch rate was possibly due to low stocking rates, although other factors were possible (e.g., drought-related low water levels). This fall, I have noticed a sharp uptick in the catch rate at Lake Davis and a corresponding increase in angler satisfaction and effort. Catch rates from both shore and boat, for both bait and fly anglers, increased into the 0.5 to 1 fish per hour range, with the large size of the fish pushing angler satisfaction (and seasonal effort) to near maximum. Given the large average size of the trout, I assume the catch rate increase is not due to higher stocking rates, because fish are usually relatively small when they are stocked. A reasonable hypothesis is that warm water in Lake Davis, due to low water levels and lack of snowmelt this past spring and summer, probably put fish off the bite. A final thought on declining numbers of licensed anglers. While CDFW does sponsor activities that promote angling for young people (see photo below), there is no general program promoting efforts, projects, and specific fisheries around the state. A more comprehensive program designed to increase angling participation, such as the programs offered by other states (e.g. Michigan, Oregon, Texas, etc. ), would help to increase angler recruitment. I like Michigan’s weekly fishing report and its fishing tips reports. CDFW needs to generate more excitement with up-to-date news, tips, maps, and techniques. Biologists, wardens, and creel census clerks collect a lot of information that they could share through volunteers or the CDFW blog. CDFW could also post, link or summarize reports from guides and shops (while giving appropriate credits). CDFW could also report on how it is managing fisheries around the state how these fisheries are faring. One topic of interest to many anglers I know is a new fishery that has appeared in the American River, apparently as a consequence of stocking trout (steelhead smolts) from the Battle Creek hatchery (Redding) in the American River (see photos below). Fishing in the City event sponsored by CDFW. Young people love these events, but the program needs to follow up with other elements to sustain their interest. Are these American River fish steelhead from the Battle Creek Hatchery? At an October 27, 2016 meeting of the Delta Stewardship Council, John Leahigh, Department of Water Resources chief operator for the State Water Project, briefed the council on Water Year 2016. Precipitation-runoff and reservoir storage were up considerable compared to 2014 and 2015. However exports were lower than expected, with reduced deliveries – only 5 to 75% – to south of Delta water contractors. A concerted effort to conserve Shasta storage (for winter-run salmon) at the expense of water deliveries, mainly to south-of-Delta contractors. Lower San Joaquin River Delta inflow that “creates a dynamic in the Delta that makes it difficult to move stored water from the Sacramento basin to the south Delta”. The important lesson here is that the state and federal water projects are flexible and nimble when it comes to water exports and deliveries. When it comes to the short-term needs of the fish and their habitat, not so much. The projects are ready with Temporary Urgent Change Petitions to benefit water deliveries, but not the environment. In the coming months and years, regulatory processes involving water rights, water quality, and endangered species will determine the future of Central Valley fishes. River Water Temperatures – holding, spawning incubation, juvenile rearing and migration. 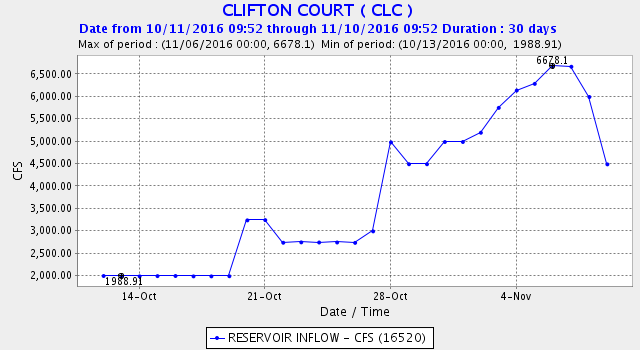 In the previous Part 1a post, I discussed river flows during fall. In this post, I discuss river flows during winter. Winter is the season of high river natural flows. Even in drought years, Sacramento River flows measurably spike during storms that provide stormwater runoff from numerous undammed tributaries and local sources (Figure 1). On the mainstem Sacramento River and those of its tributaries that also feature rim dams, most of the stormwater inflow is captured and stored for spring-fall water supply. On the San Joaquin River, all the major tributaries and mainstem have large storage reservoirs that capture Sierra and upper Valley runoff, so there is limited controlled winter runoff (Figure 2). Winter flows are needed to attract adult winter-run and spring-run salmon, smelt, steelhead, and sturgeon to upriver spawning grounds. Winter flows also carry young salmon and steelhead to the Delta, Bay, and ocean by providing velocity, water temperature, and turbidity conditions that speed migration and deter predation by birds and fish. Winter flows stimulate food production and availability. Winter flows and associated high water levels provide access to off channel and floodplain rearing areas that provide refuge and food. Winter flows clean substrate and wash gravels, and thus improve spawning conditions. High winter flows wash sediment, nutrients, and organic material into the estuary that stimulate Bay-Delta productivity. On the Sacramento River, winter flows carry juvenile winter-run, spring-run, late-fall-run, and fall-run salmon through up to 200 miles of rivers and the Delta to the Bay and ocean. Much of the route is leveed and channelized, with little cover/refuge and abundant predators. Higher flows provide turbidity and lower water temperatures that deter predation. In the San Joaquin River watershed downstream of the rim dams, flows are minimal in the absence of flood flows and dam spills. Thus, de facto drought conditions persist downstream of San Joaquin watershed dams in all but the wettest years. Recruitment into the salmon populations is confined to San Joaquin offspring produced in wet years, augmented by hatcher strays, since there is minimal juvenile survival to the ocean in other years because of low flows. In the non-flood years where reservoirs capture most reservoir inflow during the winter, supplemental releases from Central Valley reservoirs should be considered to piggy-back on and enhance natural flow pulses to benefit salmon and other native fish. Such action would most benefit salmon populations below rim dams. Such releases can be prescribed as a portion of the natural or unimpaired inflow to the reservoirs. Figure 1. Daily average Delta inflow from the Sacramento River 2012-2016 as measured at Freeport. Red circles denote winter-spring flow pulses that support important ecological processes such as salmon migration. Water years 2012-2015 were drought years; 2016 was a below-normal water year. Figure 2. Delta inflow from the San Joaquin River 2012-2016 as measured at Vernalis. 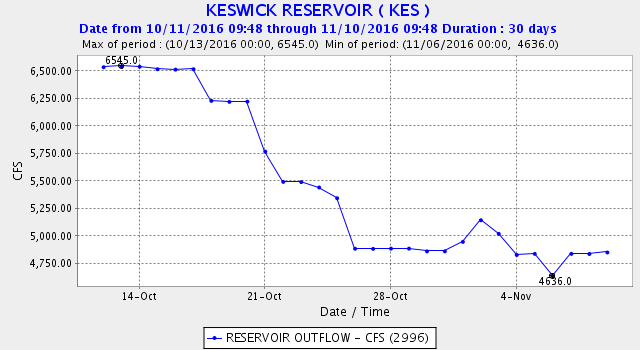 Prescribed fall and spring flow releases from reservoirs for salmon migrations dominate the hydrograph in these drought years. Winter flow pulses were lacking with the exception of 2016. Water years 2012-2016 were drought years in the San Joaquin watershed. In this post, I summarize a portion of the issues relating to River Flows: Fall Rains. Part 1b will cover winter river flows. In most years, the first substantial fall rainfall stimulates many important ecological processes such as salmon and smelt spawning runs and salmon and steelhead smolt migrations to the ocean. Figure 1 below shows the effects of 2016’s late October rains, and Figure 2 below shows the effects of 2015’s December rains, in the lower Sacramento River flows at Wilkins Slough near Yuba City below Colusa. Most of these flow pulses came from storm runoff from un-dammed upper Sacramento Valley tributaries such as Cow, Cottonwood, and Battle Creeks. Such flow pulses stimulate the migrations of young salmon toward the ocean. Figure 3 below documents these migrations in the form of rotary screw trap collections at Knights Landing in the lower Sacramento River. Under current operations, flows from the major reservoirs are generally held to the minimum requirement in the fall season in order to increase reservoir storage (Figure 4).1 What is needed are flow pulses (spills) from the major Valley reservoirs to the major rivers below dams, to stimulate the migration of the juvenile salmon spawned immediately downstream of these dams. Just downstream of Whiskeytown Reservoir on Clear Creek, Shasta and Keswick reservoirs on the upper Sacramento River, Oroville Reservoir on the Feather River, and Folsom and Nimbus reservoirs on the American River are vitally important salmon-producing reaches whose flow is completely controlled by the operation of the dams. Water releases timed to the natural flow pulses would stimulate migration from these important salmon-producing reaches, providing even more flow and stimulus for young salmon from all the Valley rivers to pass successfully through the Delta and Bay to the ocean. Meanwhile, downstream in the Delta, the CVP and SWP export facilities generally ramp up exports during the initial storm pulse (Figure 5 below shows an example from 2016). Because of the importance of the initial storm pulse, the CVP and SWP should limit exports during the initial pulse, not only to help salmon get through the Delta and Bay, but also to minimize the diversion of young salmon to the south Delta. Figure 1. 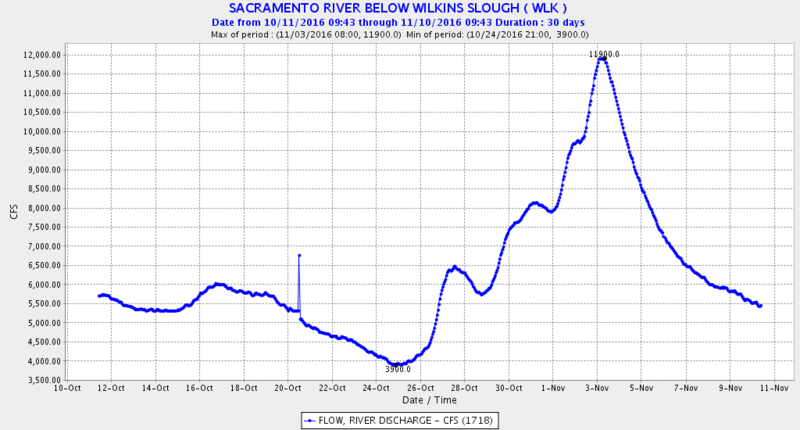 Lower Sacramento River flow at Wilkins Slough in fall 2016. Figure 2. 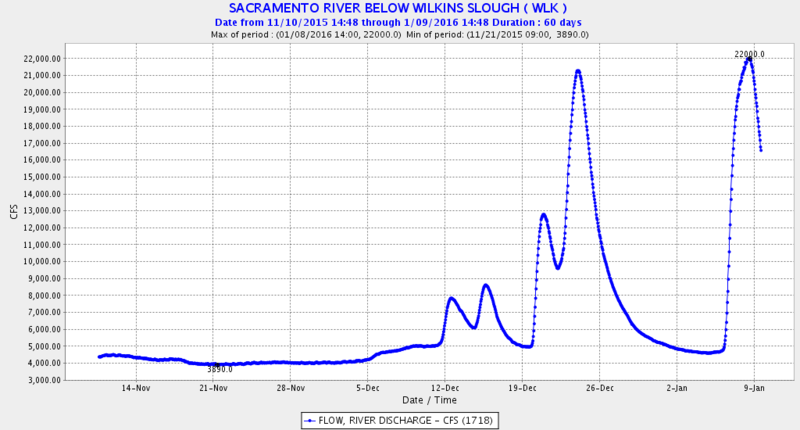 Lower Sacramento River flow at Wilkins Slough in late fall 2015. Figure 3. Catch of juvenile salmon in Knights Landing rotary screw traps 2001-2004 vs. flow in lower Sacramento River at Wilkins Slough. Figure 4. Release of water from Shasta/Keswick to upper Sacramento River near Redding, fall 2016. Figure 5. Export of water from south Delta by State Water Project, fall 2016.